Collecting data from your readers is really important for every webmaster, blogger or any other business owner. You can get feedbacks, or complaints, or you can even sell products using the right application. Also, you want to be able to use the same tool to build your email list, linking it to your favorite autoresponder service. 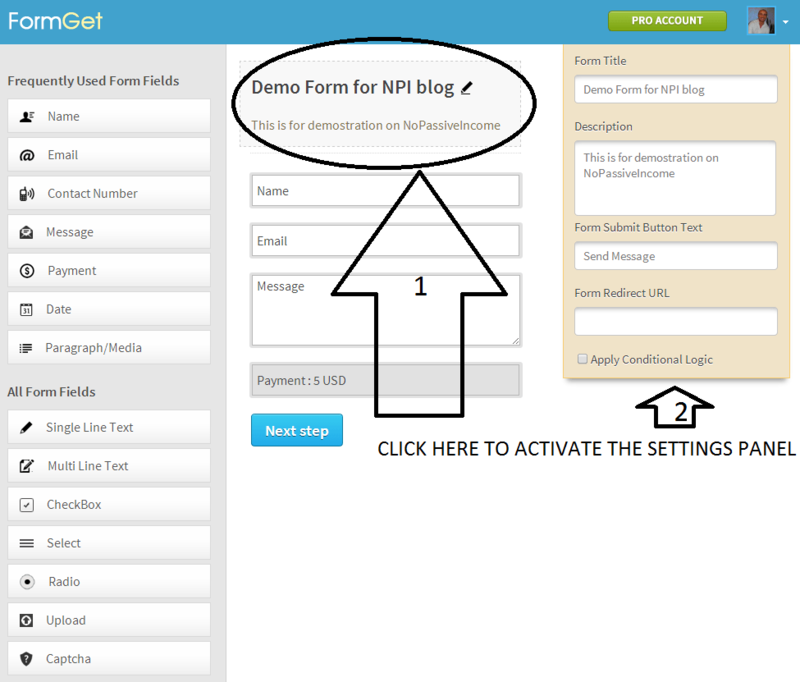 In this article we are going to talk about FormGet, a very intuitive and useful contact form creator, that offer you the above mentioned features and many interesting others. This video will introduce how this tool works and what you can do with it. As you have noticed from the video, FormGet has a powerful and at the same time easy to use interface. With a drag and drop feature, you have the possibility to create simple or complex contact forms, even collecting payments with them! 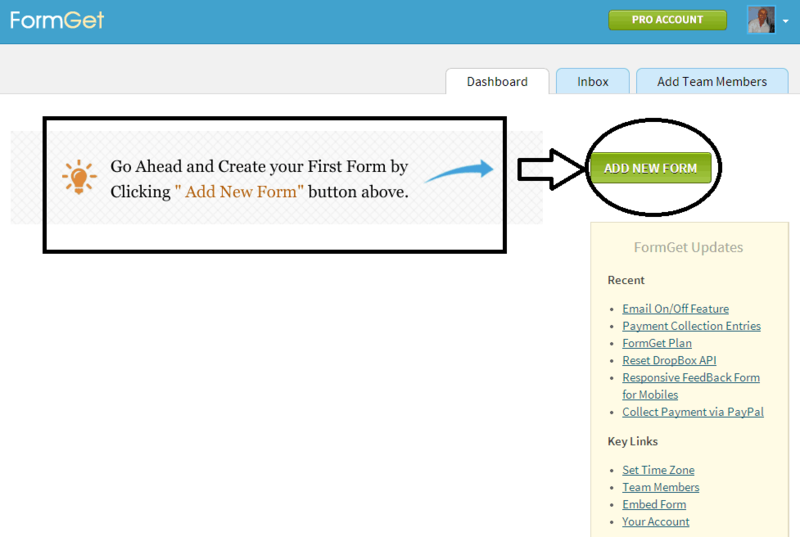 After registering to FormGet, in you will see in your dashboard the option to create your first contact form. Simply add the elements you want to be present on your form, and click again on them once added, to activate the settings panel. Once you add every element from the left side, you can adjust them by moving them up or down in your form. Just click and maintain clicked to drag them to your wanted position. 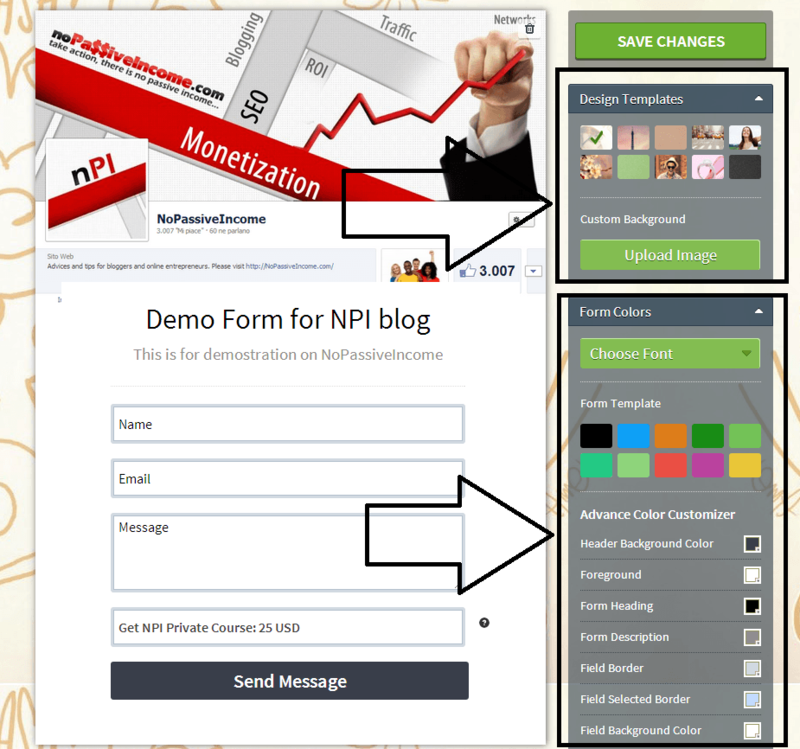 As shown in the above image, on position “2”, there is the settings tab activated once you click on your element in the middle of your form creator page (position “1” in the above image). This is where you may want to personalize the form fields, writing all the proper texts and information. One of the most interesting features here is that you can add an element in order to sell your product directly via this contact form. It could be an ebook, a training course, a webinar. You simply need to edit title, description, price and then adding a redirecting URL where your customer can check and download your product. 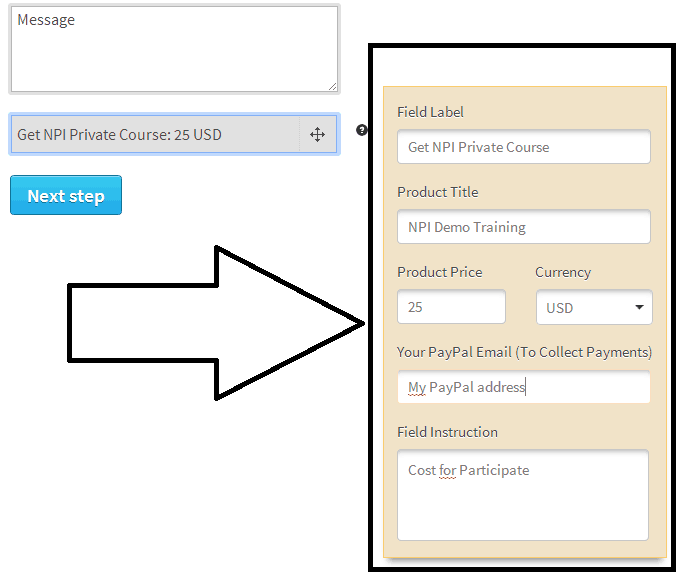 Once you added every element you need, you can click on “next step” to be forwarded to the design personalization page. Here you can add a header banner to your form, you can choose a template from the ones available or even adding a featured image for background. You can choose the font, change the colors, and personalize different elements like Form Heading , Form Description , Field Border, Field Selected Border, Button Color, Button Hover Color or Button Text Color, and many others. Also, you may want to edit the footer settings, adding your company name, description, social media profiles, address, etc. Once you’ve done, just click on “save changes”. Once you have saved your project, you can click on your form settings to display additional features. You can use the “API integration” feature, for example, to link your form to your favorite autoresponders and automatically add the users to your list. There are many autoresponders supported, like for example MailChimp, Aweber, iContact, MadMimi, Constant Contact, Active Campaign or GetResponse. You can easily add your FormGet html contact form to your site, by visiting your dashboard, clicking on the “Embed Form” link on the form and get the code. You can these embedding options : copying the code where you want your form to be seen on your site, using the free FormGet plugin in order to get it displayed on your sidebar, content, etc or (and this is a great feature) if you do not have a site, you can directly link to your form. FormGet is definitely an interesting tool to communicate with your audience, to build email lists, to sell products and for many other functions. It has an easy to use interface and with its robust features you will be able to create your form without technical knowledge. Just give FormGet a try and let me know what you think! Be sure to share your views in the comments below, thanks! wow !!! quite nice form. Very interesting and beneficial for to receive payment. I my views, i give it full marks. Thanks Erik for informing us about such nice form. glad you learned something new from this post. Formget is an amazing tools for webmasters to create forms, It can help to improve the email subscriber count. Thanks for sharing your views, Tarun. Hey Erik, you did a great work Bro. the review looking awesome and readers are going to enjoy it very much. The step by step screenshots you added in this review post is making this article more informative. glad you enjoyed the guide. Awesome forms tool, I already read review at enstine blog but got more clarity from here and I guess I’ll consider it trying next month. Thanks for sharing such a nice form, specially i loved the drag and drop feature. In today’s need every person needs easy GUI and drag and drop is a part of it. glad you enjoyed FormGet review. 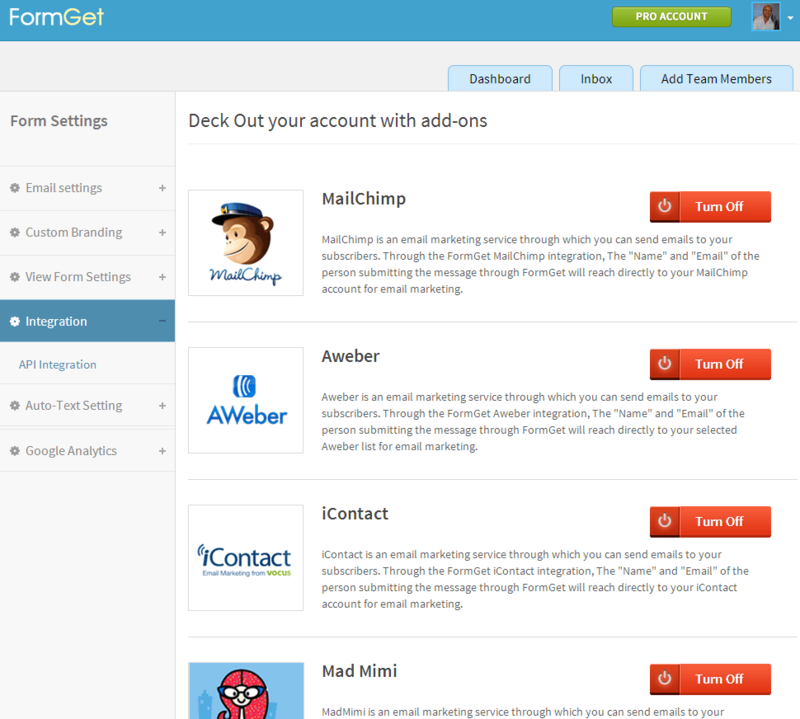 Formget is a great tool that every webmaster will want to use, my friend who uses it told me that it has great features. Thanks Erik for sharing this, i appreciate. Great to know that, Emebu! Till now I have been trying my own stuff for forms and other things related to it. I guess its time to try some thing new. let me know how it goes with FormGet. I read your whole post and this made my mind clear to chose FormGet and not Wufoo forms.One of my friend suggested try Wufoo which is way more costlier than FormGet in every business plan.So, once again thanks for reviewing formget from my side and happy blogging my friend! glad to hear this review was helpful! Amazing form with amazing features , It just a demo right? so when would there be the full version of it ?/ Anyway thanks for sharing with us..
the form I created with my account was just a demo, for showing the features in this post. But FormGet site is already live. You can try for free, if you wish. Thanks for commenting here, and have a great rest of the week! Once again a mind-blowing review of FormGet: A Contact Form Generator. Within a month a have read more than 6 review of this useful tool named “FormGet”. And always get some very nice hidden information about it. Thanks for the feedback, Amit! This looks like an awesome forms tool! I can’t wait to try it out myself! I’m sure my team will appreciate this as well. Thanks for sharing this! Thanks for sharing such great form tool. I already read many reviews in support to this amazing tool that I can’t wait to try by myself.